Manon Gignoux è un'artista-stilista di Parigi che crea solo pezzi unici: vestiti, accessori, oggetti, sculture di tessuto. Manon lavora anche a progetti d'arte e come costumista per il teatro. Il suo è un lavoro tra arte e moda, che è nato da una ricerca fotografica sugli abiti da lavoro del primo '900.Da questa ricerca, che esplorava le "tracce dell'uso e del tempo" sui vestiti, sono nati i lavori di Manon,un mix di abiti,tessuti ed oggetti usati(che mantengono la memoria del loro uso originale) e di tessuti nuovi che vengono piegati, ricamati e tinti dall'artista. Da questa manipolazione nascono dei vestiti e degli oggetti belli e moderni, ma con uno charme di altri tempi. Nel lavoro di Manon è soprattutto da ammirare il rispetto per le cose vecchie ed usate. I suoi lavori,pieni di poesia, ci ricordano che anche cose che sembrano vecchie e da buttare, viste con la giusta sensibilità possono diventare bellissime ed affascinanti. Manon Gignoux is an artist-fashion designer from Paris who creates one of a kindpieces: clothes, accessories, objects, fabric sculptures.She is also involved in artistic projects and she makes costumes for the theater. Her work, between art and fashion, was born from a photographic study of the clothes worn by workers in the early 20th century. This work explored the "traces of wear and tear" on the clothes. In her works Manon Gignoux mix used clothes and re-used objects(that retain the memory of their original use) with contemporary fabrics that she pleats, dyes and weats.New stunning clothes and objects come out of Manon's manipulation; clothes and objects that reflect the mood of their past lives but with a new function. 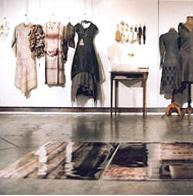 I admire Manon's respect for used objects and fabrics.Her works, full of poetry,remind me that nothing is to throw away,that everything viewed with the right sensitivity can become beautiful and stylish! manon's work is truly inspiring and shows us that each object you encounter can take on a new life as if it were the next natural phase for that object.